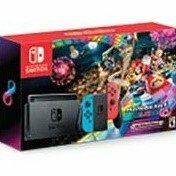 Walmart offers the Nintendo Switch Mario Kart 8 Deluxe bundle for $299. Features: Includes Switch console with Mario Kart 8 game built in (a $59.99 value). Plus dock, left and right Joy-Con controllers and more.